The glycolic peel procedure smoothes and softens the skin, diminishes fine lines, decreases acne outbreaks, evens out coloration and lightens hyperpigmented areas. Q. What Is Chemical Peeling (Glycolic peels) ? Chemical Peeling is exactly what it says - peeling of the skin using a chemical. A chemical peel removes the outer layers of the skin. This freshens the skin, removes some sunspots and rough scaly patches, and reduces freckles and irregular pigmentation. It also reduces fine wrinkles. There is some evidence that it may reduce the risk of skin cancer. It is safest and most effective on the face. 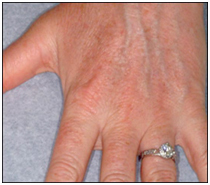 Hands can be peeled but the risk of scarring is higher and the results less predictable. Q. Who Is Suitable ? Fine wrinkling can be reduced, though deeper lines will remain, (some of which can be improved by other methods) with chemical peeling. Most brown marks, freckles and pigmentation can be removed or lessened, especially age and liver spots (lentigines). However, pigment changes can be caused by a peel in people prone to this complication due to their skin type. Those known to develop brown discolouration after injury such as a mild burn should have a test area peeled first before undergoing a full face chemical peel. Scaly patches and rough skin (keratoses) can be removed. Very thick keratoses may needadditional treatment for complete removal. Skin that is thin and fragile eg sun-damaged skin, bald scalpskin, can be significantly rejuvenated. Chemical peeling is not a substitute for a facelift. It does not tighten sagging skin, stimulate collagen production or remove broken capillaries. Chemical peeling is not appropriate for people who will continue to have excessive sun exposure. Q. How it works ? Glycolic acid removes old, damaged cells on the top layer of skin and as a result it smoothes and softens the skin, diminishes fine lines, decreases acne outbreaks, evens out skin tone coloration and lightens hyper pigmented areas. The Glycolic Peel can be performed on the face, neck, chest, hands and even the arms and legs. Q. How does it feel ? The solution is applied to the skin and patients usually note a burning sensation similar to a sunburn after the procedure. As with any exfoliation or resurfacing, it is important to use sunscreens, because the skin is more susceptible to injury by the sun. Generally, multiple treatments are necessary which is determined by the Esthetician after a free skincare consultation. The patient may notice dryness and/or peeling 3-4 days following their treatment. Glycolic acid peels are not recommended during pregnancy. 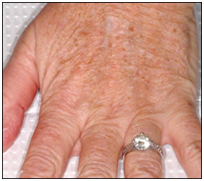 Occasionally, patients with very sensitive skin may have mild temporary redness or irritation. Q. How long does it last ? Mild Glycolic Acid-based peels take about 10 minutes. Most people notice a change in the skin right away. For optimal effect it is recommended that Glycolic Peels are performed weekly for six weeks. Significantly decreases the appearance of fine lines and wrinkles, stimulates collagen and elastin. Make-up can be applied immediately and normal activities can resume after treatment. Q. Are Glycolic Acid Peels safe ? Since they produce only a superficial peel, glycolic acid peels have a very good safety profile. Initially, there will be some redness which normally resolves within a few hours. There is potential for lightening or darkening of the skin, but this rarely occurs. Some patients experience no redness; the occasional patient will develop more pronounced redness, swelling and crusting. A mild topical steroid cream may be applied, and the reaction will subside. Most patients return home, to normal activities, or return to work immediately after the peel. Minor adjustment in cosmetics and care of the skin is required following the peel. Your skin will be more sensitive to the sun for several weeks after the peel. Regular sunscreen (SPF 30 or higher) use is required.